WWM consist s o f independen t 30. 9 to n modules designed specifically to be fully accessible from only one side. The modules can be linked together side by side, back to back, and stacked to reach a capacity of 960 tons. chillers making them ideal replacements of old, inaccessible machines. The WWM is equipped with motorized hydronic valves and factory mounted differential flow switches for operation with variable flow and constant flow systems. to be stacked two levels high. With WWM, you can combine up to 32 units designed to minimize the overall dimensions. Thanks to its modular construction, the installation can be adapted to suit specific system development needs whilst guaranteeing improved safety and reliability. As a result, the cooling capacity can be easily increased over time, at a limited cost. The modules are easy to install and link together hydraulically, via grooved pipe connections. Optional Power Bar, facilitating single point or multiple point electrical connections. The WWM units are completely enclosed and sound proofed which provide the quietest sound levels in the industry. 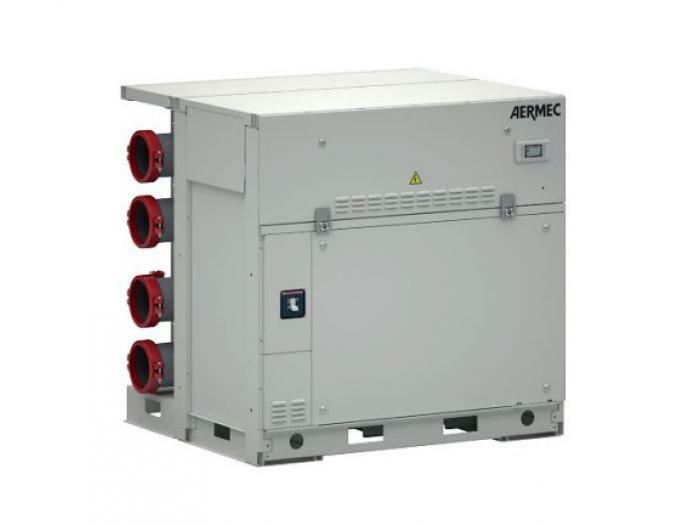 Each module is capable of being operated and controlled as an individual chiller. operate. The controller is easily operated via a unit mounted LCD screen and multi -language menu. Each module manages and logs its own alarms. WWM has butterfly shut-off valves on both hydraulic lines for disconnecting the circut when maintenance needs to be carried out. the operation of the modules to maximize efficiency and proper system operation. The usual panel is a 7" touch screen with numerous communications options. WWM's chassis, containing all refrigeration components can be disconnected from the piping assembly for service, maintenance or replacement without impacting the operation of the remaining units.